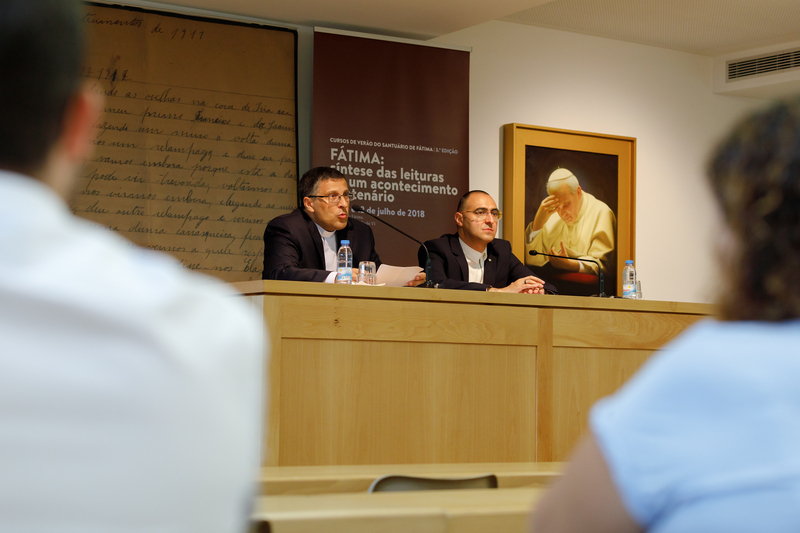 The 3rd Edition of the Summer Courses of the Shrine of Fatima, whose theme is “Fatima: synthesising the interpretations of a century-old event”, has begun this morning in the Centro Pastoral Paulo VI. Fifty-two researchers and professionals, from 12 scientific disciplines, participate in the training initiative proposed by the Department of Studies of the Shrine that will end on the 12th of July. “It is not a very ancient tradition, but it is a proposal which makes a lot of sense for the routine of the Shrine,” he underlined. Father Vitor Coutinho considers that “no other Shrine in the world invites as many resources to study and think” as the Shrine of Fatima does. The students come from various areas: History, History of Art, Journalism, Religious Sciences, Economics, Archivism, Conservation and Restoration, Tourism, Geology, Civil Engineering, Sociology, Linguistics, Archaeology and Anthropology. Marco Daniel Duarte, Director of the Department of Studies of the Shrine of Fatima, coordinated the Summer Courses; he joined the training team that also includes researchers, technicians and experts in various areas: religion, history, philosophy, communication, arts and restoration. For the 2018 edition, the objectives of the summer courses will include, among others, the interpretation of the content of the Message of Fatima through a multidisciplinary analysis of specific aspects of the phenomenon, the study of the sources of the event and the presentation of elements of its history. Apart from being an opportunity of learning, the 3rd Edition of the Summer Courses offers to the participants the possibility to visit the following museological spaces: the House Museum of Aljustrel, Francisco and Jacinta Marto’s House, Lucia de Jesus’ House, the site of the Apparition of the Angel and of the Marian Apparition of August, the House of Candles, the Museum Centre of the Foundation Francisco and Jacinta Marto, and the Museum Centre Father Formigão: House of the Apostle of Fatima and the Museum Centre of the Sisters of Reparation of Our Lady of Fatima. The Summer Courses of the Shrine of Fatima intend, thereby, to bring the scientific community closer to the themes of Fatima. This is the third edition of an annual proposal for studies. The first edition addressed transversal and introductory questions about Fatima. Last year edition adopted a thematic approach, on which base it has been possible to develop specific themes like the link between the Popes and Fatima and the biographies of the protagonists of the century-old event.